"I have eaten hummus a few times a week for years now. A couple years back I wanted something different, so I started messing around. 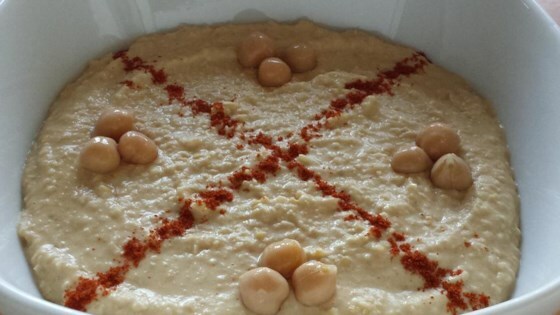 After a few trial runs, this recipe represents my favorite hummus." Place chickpeas in a blender; top with olive oil, lime juice, tahini, and garlic. Blend mixture until smooth. Add water 1 tablespoon at a time and blend until desired consistency is reached. Add paprika, cayenne pepper, and cumin; blend until incorporated. Try different brands of chickpeas, as they will yield different consistencies (smoother, chunkier, etc.). I use lime juice, but lemon works if you prefer. I put a little under 1/4 cup so it is a little more subtle. People tend to enjoy different amounts of tahini, distinct and thick. I put in a little under 1/4 cup. Cumin is a strong spice, so try a little under a 1/4 teaspoon first to see if you would want more. Depending on your consistency preferences and the type of blending unit being used, you may want/need anywhere up to 1/4 cup water. So easy to prepare, and a huge bonus is the ease of customization. This recipe is very similar to the one I currently use (South Beach Diet). Instead of water I use the liquid from the can of chick peas. Our favorite hummus recipe so far. I typically add some roasted red peppers to this as well. This is the best hummus I've made yet. I added some lime zest and salt, otherwise made no recipe changes. This was great hummus! We loved the kick the cayenne added. Like others, I used the liquid from the chickpeas in place of water.